2017 Community Achievement Award Recipients. Congratulations! 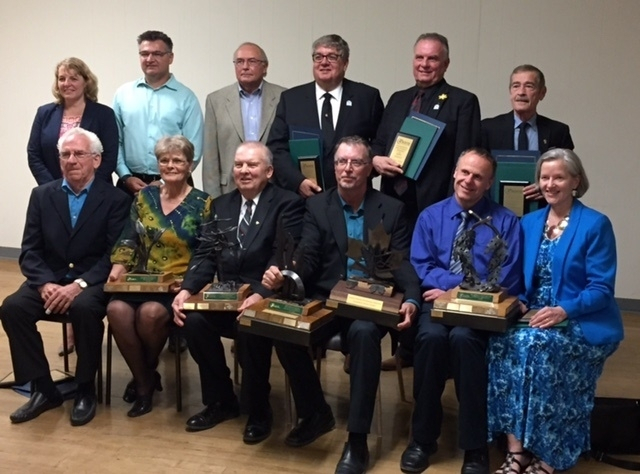 Congratulations to all of the nominees and recipients at last night's Minto Chamber of Commerce Community Achievement Awards event. Special thanks to our esteemed judges, generous sponsors, entertaining emcee Glen Hall and all who attended. Front Row L-R: Ron Leslie-Leslie Motors, Gerry Leslie-Leslie Motors, Laverne Stinson, Jack Walsh-Wightman Telecom, Felix Weber-Ag Business & Crop Inc., Bernice Weber-Ag Business & Crop Inc.
Not Present: Greg Desaulniers-Rural Spoon Cafe, Luke & Crystal Hartung-Minto Farmer’s Market & Harwill Farms, Jim Harkness-Harkness Equipment Ltd. & HARCO Ag Equipment.